Tibet: Brief History - The Tibetan Community of Australia (Victoria) Inc.
Invaded by China in 1949-50, the independent country of Tibet was forced to face the direct loss of life that comes from battles and, soon after, the loss of universal freedoms that stemmed from Communist ideology and its programs such as the Cultural Revolution (1966 - 1976). However, it is erroneous to believe that the worst has passed. The fate of Tibet's unique national, cultural and religious identity is today seriously threatened and manipulated by the Chinese. China's policy of occupation and oppression has resulted in no more or less than the destruction of Tibet's national independence, culture and religion, environment, and the universal human rights of its people. China has broken international laws and routinely violates its own constitution by inflicting this destruction, yet time and again goes without punishment. With a written history of more than 2000 years, Tibet existed as an independent sovereign state prior to Chinese rule. As recently as 1914, a peace convention was signed by Britain, China and Tibet that again formally recognized Tibet as a fully independent country (picture below). But having no representation in the United Nations, the world largely stood by and allowed China's occupation and destruction to happen. 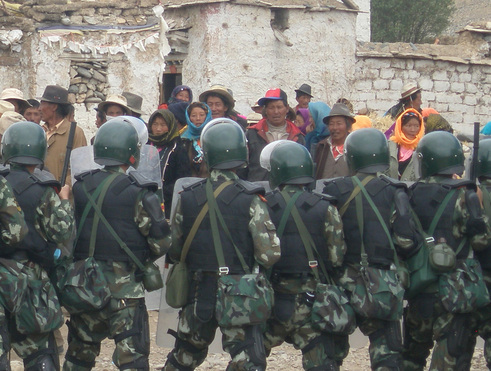 Tibetans have demonstrated repeatedly for independence from China. Ours has been a non-violent struggle, yet even when Tibetan children as young as ten whisper the words "Tibet is independent" or "Long Live His Holiness the Dalai Lama", the Chinese accuse them of trying to "split" the "motherland" and often sentence them to prison. Possessing an image of the Tibetan national flag can lead to a seven- year jail term. As of 1998, 1083 known Tibetans remain incarcerated in Chinese prisons on account of their political, religious or ethical views. Of these, 246 were women and 12 were juvenile.